Waterfront Airport Hotel and Casino Mactan and Waterfront Cebu City Hotel and Casino in Lahug recently joined forces to give homage to the homegrown flavors of Cebuano and Filipino cuisines in a food festival called "UNO's Modern Filipino Taste: A Filipino Feast for All Senses". And I was one of the lucky people who got invited for an amazing opportunity to try the homegrown Cebuano flavors and traditional Filipino treats that were given surprising and mouthwatering twists by the celebrated husband-and-wife culinary geniuses, Chefs Roland and Jackie Laudico. The Filipino Feast is located at UNO, the Waterfront Group of Hotels' popular international buffet and a la carte cafe and restaurant. 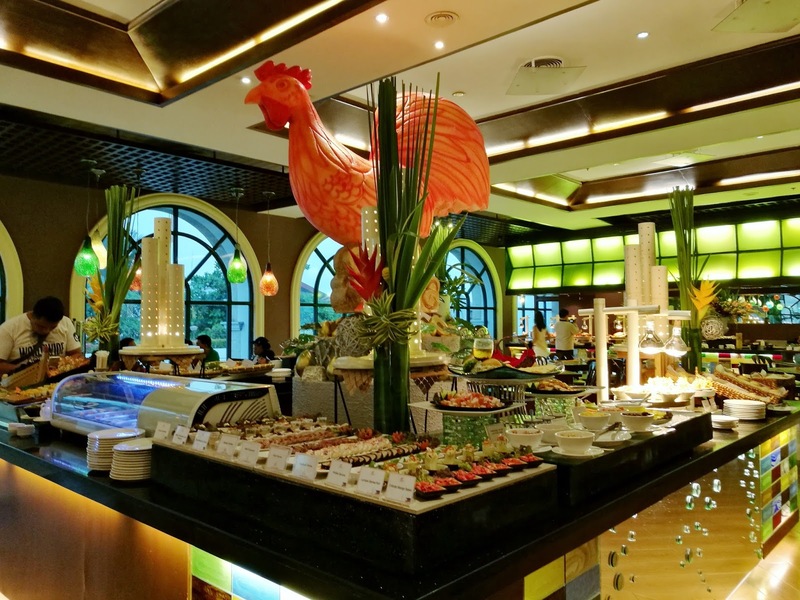 Waterfront's UNO, is one of the most popular dining spots in Cebu, which offers an all-day buffet featuring a wide array of international and Filipino culinary favorites, making it a must-visit destination and foodie paradise in Cebu and Davao. What I love about UNO is it has a casual, leisurely vibe, and a friendly and cozy ambiance making it a great place for families and foodies to dine in. For "UNO's Modern Filipino Taste: A Filipino Feast for All Senses", the two inventive chefs updated old-time favorites, popular comfort food, and classic dishes by the subtle addition of new and enticing flavors, and presenting them in ways that catch attention and whet the appetite. You will know that the dish was prepared by Chefs Roland and Jackie when the label has a Filipino flag. For the appetizers, Chef Roland (or famously known as Chef Lau) created a combination of time-honored flavors and novel twists in such delicious selections as Balut Napoleon (layers of balut flavor plus shots of its savory juice), Ngohiong Cones served with a spicy sauce, Sinigang Bites (tamarind-spiced kangkong chips topped with bangus mousse), and Palabok Bites, (the goodness of palabok topped with Carcar chicharon). For the main dishes, again Chef Lau made modern twists to traditional dishes such as Seafood Paella Negra (made with fresh seafood and squid ink), Paella Valenciana, Fried Humba, Caldereta Pie, Inasal Siomai (fuses Chinese and Visayan techniques), Barakong Liempo (marinated in kapeng barako), and a lot more. Since Cebu is famous for its lechon, Chef Lau made four versions — Regular Lechon Belly, Spicy Lechon Belly, Lechon Baka (Cow), and Lechon Kambing (Goat). What makes Chef Lau's lechon different and unique is he used a local herb called sangig or lemon basil to make the lechon more aromatic. Other must-try carvings are Sinampalukang Turkey, Pinaupong Nilasing na Manok, and Bacon Bagnet. Chef Jackie takes the spotlight when it comes to desserts (what a perfect combination!). Her take on giving modern twists to traditional Filipino desserts come in different unique flavors such as Biko Latik Mousse, Queso de Bola Cheesecake, Bicho Bicho Yema, Suman Panna Cotta, and many more. But the highlight of Chef Jackie's desserts, which you shouldn't miss, is the Molten Tablea Cake (not in photo). It's like the lava cake that we know but made with tablea and Davao chocolate inside. This must-try dessert though is made to order (so be sure to ask for one!) and is served in a small bowl. According to Chef Lau, "Cooking, like any facet of culture and art, keeps evolving and transforming in tune with changing lifestyles and the development of technology. The concept behind ‘UNO's Modern Filipino Taste: A Filipino Feast for All Senses’ looks to tradition for inspiration, but extends to the possibilities of the future. The tastes we presented find a delicious common ground between heritage and technology. Thus, the flavors are familiar but surprising." The Filipino Food Fest will run up to August 31, 2017 at the UNO restaurants in both Waterfront Airport Hotel & Casino and Waterfront Cebu City Hotel & Casino for only PHP 898 nett per person. They are open daily at 11:30AM - 2:30PM for Lunch and 6PM - 9PM for Dinner. For inquiries and reservations, call (032) 340-4888 local 7879 or email wahc@waterfronthotels.net. Wow, this food looks absolutely amazing! Great photos! Wow!! The food and decor look stunning!! So jealous! !